It’s officially official! 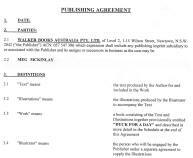 The contracts for Duck for a Day are signed, sealed and delivered and at this stage, the book is scheduled for publication in 2010. Duck for a Day is an illustrated chapter book for ages 6-9 and it’s about a girl who has to contend not only with a new teacher but also with a duck named Max who is most definitely not your average class pet. The entire manuscript grew from the words “The duck was different. The duck had demands”, which popped into my head one day and refused to leave. I have seen some early sketches by the illustrator and they are simply gorgeous. I can hardly wait to see the finished product. But I will, of course, and while I’m waiting, I will write more books. This entry was posted in Chapter Books, Duck for a Day on April 25, 2009 by Meg McKinlay.